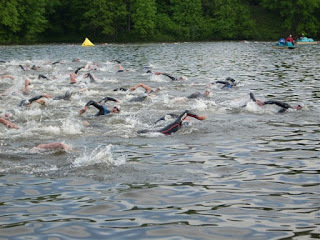 The Ramblings of an Endurance Junkie: Columbia Triathlon Race Report....Smoking! Yep, the fire alarm had gone off at 2:10AM and after looking out into the corridor and seeing smoke coming from the 1st floor, we decided it wasn't just a test and the hotel emptied out into the parking lot. 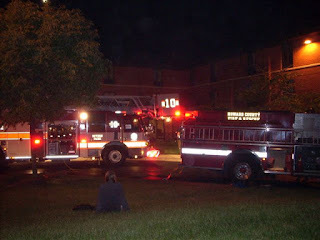 In the end it was much ado about nothing (fortunately) and after the local fire service bringing everything and the kitchen sink (about five different kinds of engine), we were allowed back into the building just after 3:00AM. Nothing like a good nights sleep before a race! Only a short time later we were awake and on the way to race (only 10mins from the hotel) and setting up transition with 2000 others....including a stacked pro field of Chris Lieto, Chris McCormack (2007 Ironman World Champion), Richie Cunningham, Desiree Ficker, Amanda Lovato and Rebeccah Wassner. Once the pro's headed out onto the course the age group waves begun and I had a 45min wait until my wave......to say that Sarah and I were tired and tetchy would be an understatement, perhaps not the best frame of mind for racing (or spectating!). Eventually the 30-34 age group wave was in the water and we were on our way. The start was surprisingly brutal and it took a while for the field to settle down and spread out. For some reason it also took me a while to get into any kind of rhythm and I didn't really feel "comfortable" until the second half of the swim when we were catching the previous waves. I came out of the water in 16th place and a new PR for this course...22mins 19secs. The bike section of this race was to be my main focus and I was going to push it as hard as possible. The Columbia bike course is one of the hardest and covers 41km of rolling roads with not a lot of places to "rest" (not that Chris Lieto would say that after smashing the bike course record!). Last year I covered the bike course in 1hr 8mins 46secs and managed to crush that by putting in the 4th best bike in the age group with a 1hr 6min 10sec ride, which had me in 7th place entering the run. After a slight mishap of my right shoe coming off the bike in T2, I was onto the run with the fastest transition of the day and ready to run a few people down! Approaching the "Gatorade Wall" at mile 3 I passed into 3rd and was still at a 6min/mile pace, although the hills were feeling that much harder now! With three miles to go I knew that I had a chance of creeping in under 2hrs 10mins if I kept my current pace and that would be a 5min improvement over last years result. After a short loop we were climbing back up the "wall" and heading back to the lake when I was passed by a fast-moving Eric Lavigne and I dropped to 4th (Eric had a great run at the Duathlon Nationals this year but after being sent the wrong way on the bike he lost significant time and was out of the race for the overall). For the final 1.5miles I kept 3rd place in sight and crossed the line 4th in age group and 29th overall for 2hrs 9mins 6secs with a 37mins 21sec 10km run. The top four in our age group were separated by only a minute and 1st beat out 2nd by 2 secs!. For me this was a 5min 30sec PR on this course including PR's in all three elements of the race and importantly a strong bike on a tough course. If you listen closely to the commentary you will notice that he correctly explains the background to the spelling of Iain as opposed to Ian! but no I am not Scottish. Racing takes a break now for three weeks until we hit Eagleman 70.3M, the main goal for the first half of this season. Two more weeks of hard training and then a taper week to arrive on the shores of the Chesapeake ready to rock. Hopefully we won't be seeing the Easton Fire Department outside the hotel in the wee hours of the morning for that race! GREAT race! I thought it was only going to the fire that was smokin' but it was your race too! Way to hang tuff under a less-then-ideal sleep!